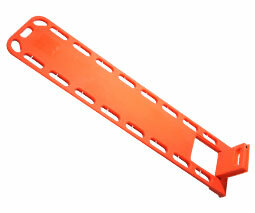 The Newest Innovation in Patient Extrication. 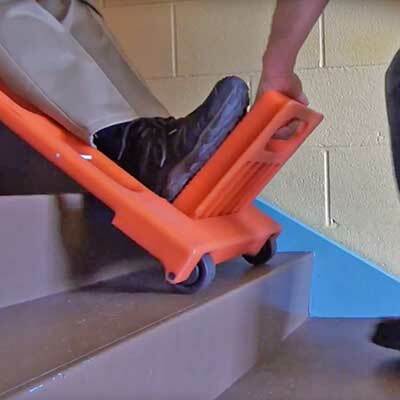 A dolly designed specifically for transporting people while preventing first responder back injuries: extricate patients from tight or restricted spaces by rolling, not carrying. Designed to prevent first responder back injuries and extend careers, the WauK® board is the newest innovation in patient extrication. It's a dolly designed specifically for transporting people. It allows first responders to roll their patients to safety instead of carrying them. Two 3" diameter wheels at the foot end provide smooth rollability. A rugged built-in foot rest perpendicular to the board when opened, or flush with the board when folded shut. length from top of foot rest to head of board 74" 71"
thickness at wheels 3.5" 3.5"